Red Box Fire Control offer Fire Safety Services and will ensure your business is compliant with Fire Safety Regulations. If you are organising an event or you have a temporary business premises which requires fire extinguishers, Red Box Fire Control can help. Red Box Fire Control can supply your business with any fire safety accessories you may need, from fire blankets to extinguisher trolleys. You must undergo regular Fire Risk Assessments for your business to remain compliant with Fire Safety regulations. Red Box Fire Control can help you with you Fire Risk Assessment. View our Fire Fighting Equipment, Safety Signs, Fire Warden accessories and Evacuation Chairs. Our range of services include: Fire Risk Assessment, Staff Fire Training, Surveys and free advice. Your complete business-focused resource for all information and links to a wide range of Fire Safety issues. 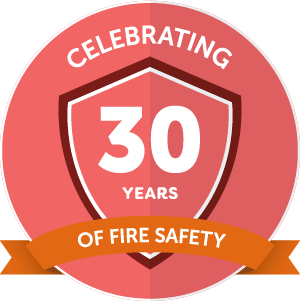 We've enjoyed helping our clients meet their Fire Safety obligations since 1987.
Who can Service a Fire Extinguisher? In a recent blog of ours, we spoke about how often fire extinguishers need to be serviced. It can be surprising just how regularly they need to be checked and serviced. However, they’re a vital piece of equipment in the protection of people and businesses, so neglecting a fire extinguisher’s maintenance could result in a disaster.